ACTIVE SENSORS: Used by drones and fighters to spot opponents, active sensors operate by sending out a signal in the EM spectrum to bounce off the enemy ship. Despite their great power, active sensors also give away the position of the sensing ship, limiting their use in combat situations. A common High Guard combat tactic involves relying on passive sensors (see passive sensors) sending out automated drones to take active readings and relay them back to the mother ship. AP GUN: A weapon that shoots a stream of anti-protons at near light speeds (99 PSL). Anti-protons that hit mass (the enemy ship) destroy it. An AP Gun is not effective beyond about 4 light seconds. AP POWER CONVERTER: Converts the AP (see Technology, Anti-Protons) and mass reaction into electrical power for an item (such as the Gravity Field Generator or MPD Thruster) to use. AP power converters come in all different sizes for use by ships, fighters, drones, or missiles. Also known as an AP Reactor. ARGOSY: The space-based branch of the Commonwealth High Guard. 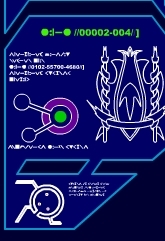 Starship-based High Guard personnel are referred to as Argos (or "aggros" by their Lancer counterparts). ARTIFICIAL INTELLIGENCE ENTITY (AIE): The sentient quantum computer systems at the heart of each High Guard starship. AIEs use continuous logic neural network systems with self-enforcing Feynman Influence Processors. During multiple platform operations, AIEs "negotiate" combat responsibilities based on established doctrine, rules of engagement and their commanders' intent. BANDER: A small self-guided device. It is the size and shape of a Human throwing disc. When tossed, the bander unwinds into a series of coils, then wraps around its target, immobilizing it. BRACER: A bracer is worn on the arm and can also be expanded into a physical shield for defensive purposes. In shield mode, a bracer's surface is optically reflective to reflect laser beams and is strong enough to deflect bullets and other kinetic projectile attacks. In addition to their combat capacity, bracers incorporate a number of sophisticated electronic devices, including portable computers, communicators and sensors. C4I ARCHITECTURE: A description of the Command, Control, Communications, Computers and Intelligence network that enables the flow of information between and among starships. The AIE forms the "virtual hub" of this network on a specific ship, but high levels of systems integration render the description nearly meaningless, except under special circumstances. COUNTER-COUNTERMEASURE (CCM): Used by a ship's sensors to counter the effects of enemy countermeasures (see countermeasures). COUNTERMEASURES: Steps taken by ships in order to avoid being spotted, including sensor jamming, chaff and other distractions. DATALINK: Low power lasers that carry secure information between all the ships, drones and missiles of a fleet. DEFENSIVE MISSILE: The main defensive weapon against incoming offensive missiles in ship to ship combat. Defensive missiles can also be used as enemy fighters, which are smaller missiles (about 1/3 of a kilogram). They move slower than offensive missiles (60 to 70 PSL), but with twice the acceleration. They have a range of only 5 to 10 light seconds. DRONE: A small, unpiloted vehicle typically used as sensor and jamming platforms.